Recently, I made two pieces for two different costumes. I will eventually share those costumes with you, but I decided to share the two pieces together. 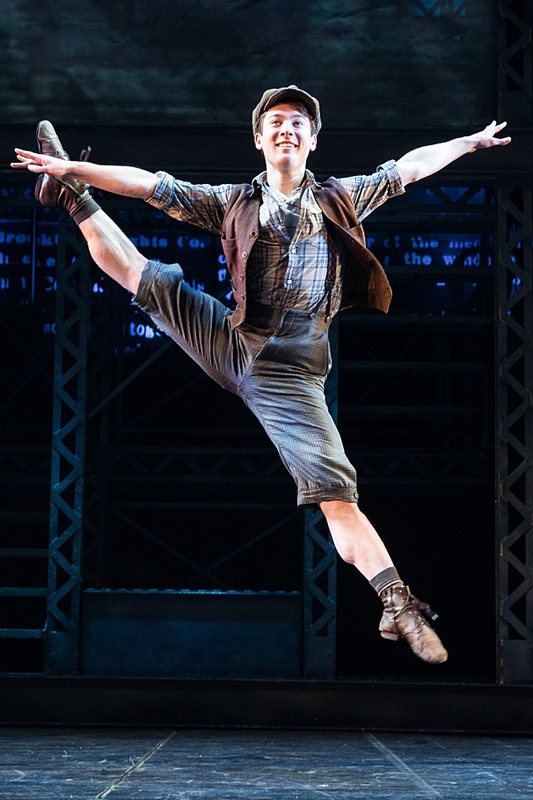 It looks a bit like an outfit worn by a member of the Newsies cast. I just need suspenders and a pageboy hat. Now if only I could jump that high and do the splits without dislocating my hip! hahah! 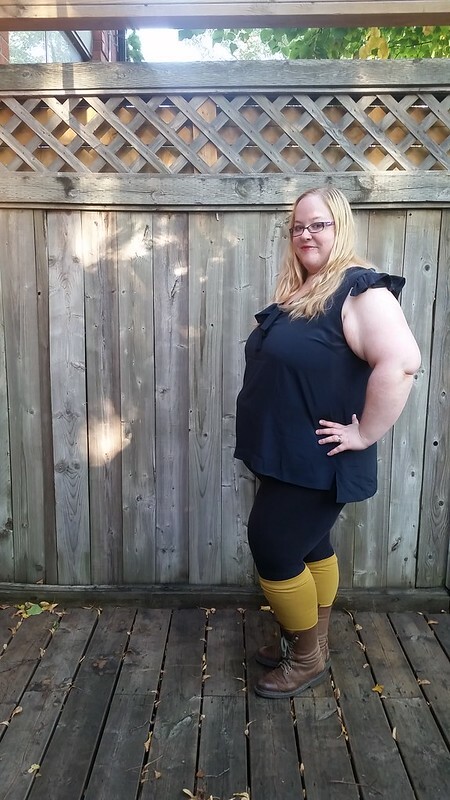 I made the vest using the Cashmerette Concord t-shirt pattern with the v-neck. 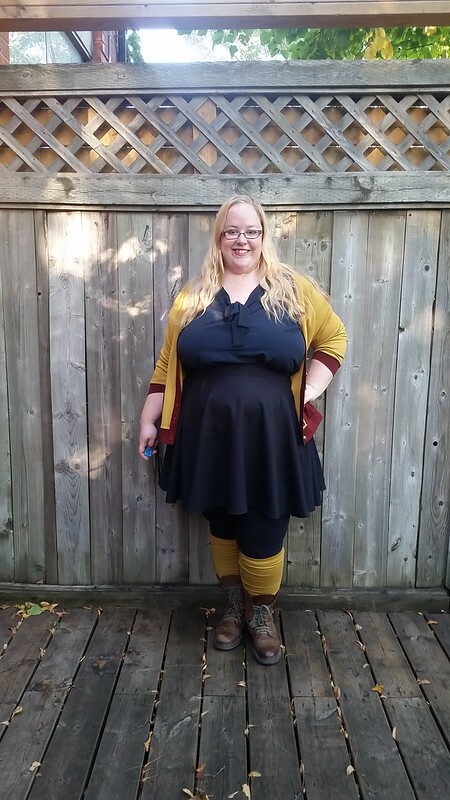 I used a hacci knit in a dark grey/brown colour and put bands on the armholes and the bottom hem. It was a quick garment to make up and it took me about 30 minutes once I factored out serger issues. 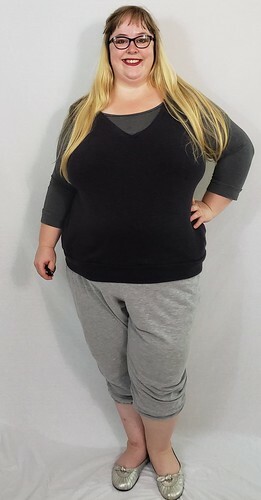 The capri sweatpants are made using the Blank Slate Patterns Forsythe trousers and using a jersey sheet from the thrift store. I put elastic in bands on the hems of both legs. 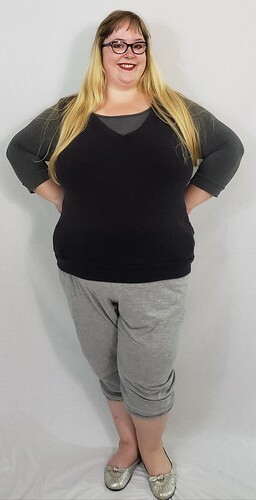 I know I made this capri sweatpants for a costume piece, but they are super duper comfortable and I throw them on so often that I need to make another pair so I don’t wear out this pair since I need it as a costume piece going forward. The only thing I would change (and you can’t tell in these pictures) is to switch out the slash pockets for side seam pockets since jersey fabric tends to droop a bit more and the pockets don’t look that good. I also got an old UFO finished. I haven’t actually made the Cashmerette Harrison pattern in the final version. I tested it, though. What you can’t see is how incredibly uncomfortable I am in this top. That’s not really a pattern issue, but a few different issues. 1) The fabric I used is actually a poly cotton. I bought it thinking it was cotton and being told it was cotton to wash it and go….uh this is poly cotton. Disappointing. Too bad you can’t do burn tests in stores to prove store keepers wrong. Anyway, it’s been a while since I bought it and it was only 5 bucks for like 4 yards so I am not going to complain. But I hate it. I originally made this with the longer sleeves and then needed to chop off the sleeves to see if that would help. It did a bit…. but not really. 2) OMG my sewing is wonky on this…. I didn’t have consistent seam allowances for it at all. 3) I just don’t have symmetrical shoulders at all (thanks EDS!). The button band just does this super weird thing in the centre because one breast is higher than the other and it’s throwing those double princess seams in weird directions. 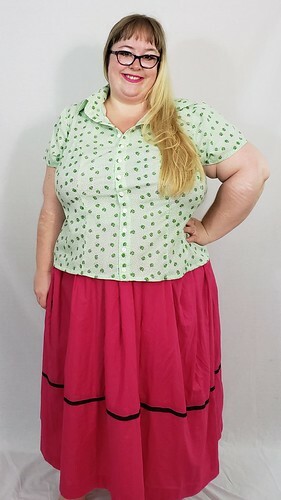 It’s not really an issue when it’s only one princess seam per side or when it’s a darted bodice, but on this style… it just doesn’t work for me. 4) I am bigger than when I cut it out so it doesn’t fit well at all…. booooo. I will be putting this in the donation bin, but I wanted to share it. It’s a good pattern but just doesn’t work for me and that is okay! I am definitely thinking about making a pageboy hat…. It’s been a while since I posted. I’ve been busy with a lot of pattern testing that I can’t share yet and a costume project that I can share, but didn’t take many pictures of, and a few other smaller projects one of which I will share in a different post. 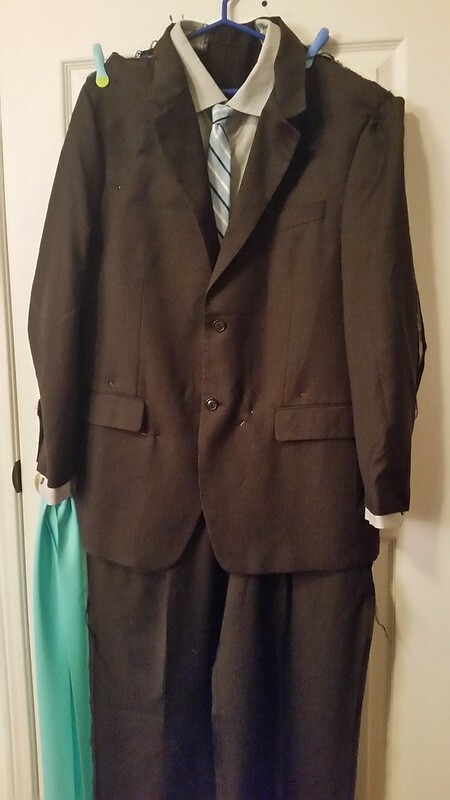 For the costume project, I took apart a suit and two jumpsuits to make them tearable for a friend’s sketch show. This is the only picture I took, but it reminds me of Flat Stanley and makes me giggle a lot. The suit ultimately needed to be made into a jumpsuit and then the front needed to tear away from the back. My old Brother SQ9050 kind of died after this project. I broke about 10 needles during the project and it struggled through every bit of it. Afterwards, the feed dogs just stopped working completely. RIP Jane Eyre. 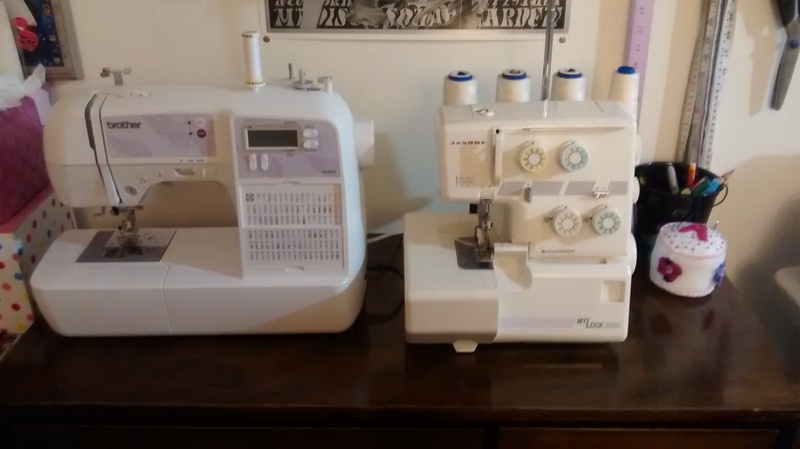 Rochester, my serger, will be in mourning forever… I do want to see if I can fix Jane so I can use her as a backup machine or even use the different stitches. I don’t want to take her into a shop, though, so it would be purely DIY. I did that with my serger at one point and fixed the timing. I think the connection to the feed dogs is probably where to look. And I looked briefly at the Brother site and saw that parts are available including new feed dogs. Meet Brienne of Tarth. 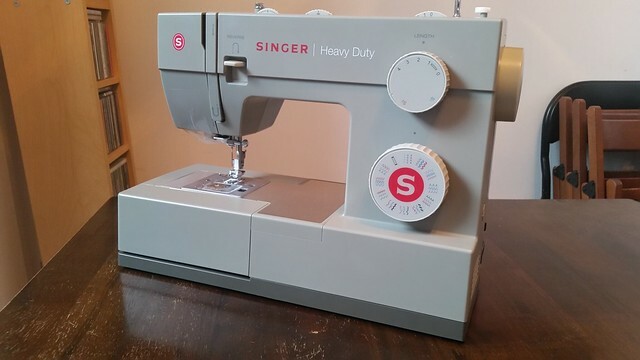 She’s a Singer Heavy Duty 4452 that I purchased off Amazon. Brienne of Tarth is aptly named because she is a workhorse and can take anything I throw at her. She has a metal frame and a fast motor meaning I can go up to 11,000 stitches per minute. So far, I love this new machine. Moving from a computerized to a manual machine is a bit of a learning curve, but not impossible. My first machine was manual, but I didn’t really remember a lot from that time. I also think I didn’t really learn what I could about the stitch settings and am taking my time to learn with this new machine. I thought at one point I would save up to get a Pfaff, but I think that is out of range for now. The positive of this machine is that is extremely affordable. I’ll do a full review after I work with it for some more time, but so far is is doing a far better job than my Brother ever did. 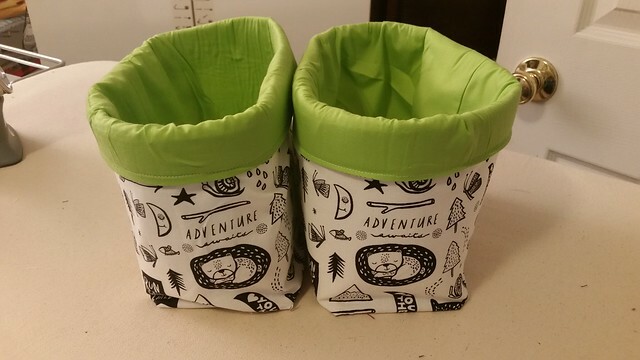 I started off with a simple project of some fabric bins for the first project with Brienne. I used this tutorial on Birch Fabrics to make them for my friend. I did change the shape slightly into a rectangle due to a cutting error, but I love the rectangular shape. I also used fusible foam instead of a heavy interfacing so they stood up better. I have fabric and foam left to make myself a couple of fabric bins. 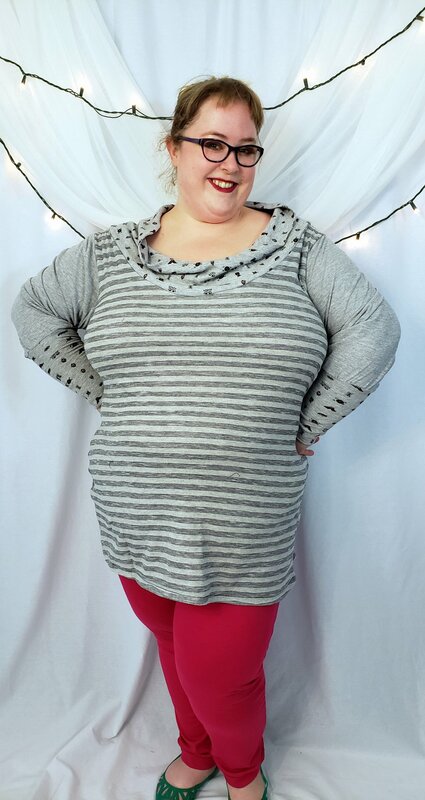 The fabric is a gorgeous heavy wool knit blend with stripes on one side and floral on the other. I decided to go with the stripes on the outside, but have the floral showing on the collar. I ran out of fabric as well so I had to cut the pocket and the tie I decided to add from a dark wool. To make the whole thing less blah, I will be finishing the inside seams with a lime green bias tape made from the fabric in the bins above. 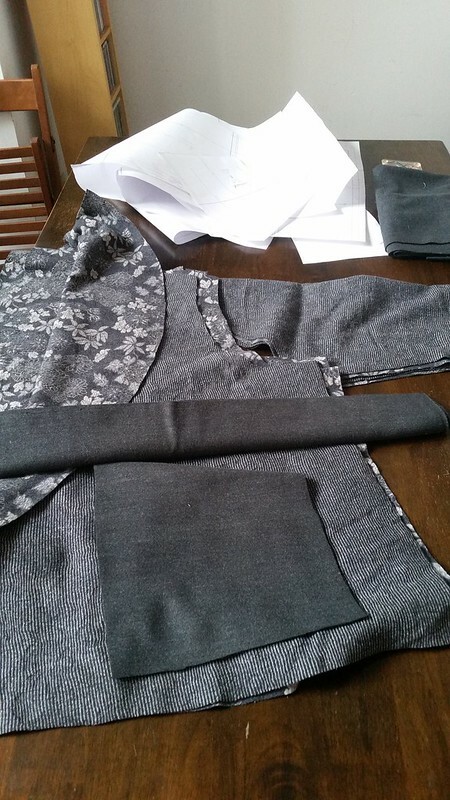 😀 I shortened the coat by about 10 inches for two reasons: 1) I am super short (5’3″ at last measuring) and the hem would have hit me at mid calf when it is supposed to hit mid-thigh; 2) And then when I was cutting it out…. I had to shorted it again to get the main pieces to fit on the fabric and they *just* fit. This actually might hit me mid-thigh now…which makes me wonder if they made the pattern for a person with Brienne’s proportions… I’m excited to share this later on this month on the CSC and then again here. Cross your fingers it all goes well. 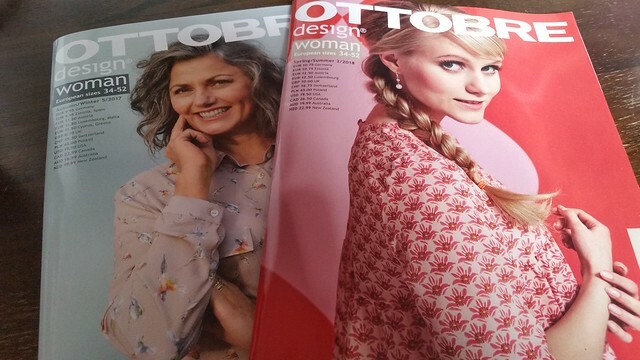 In other news, I received my first sewing magazines in the mail from Ottobre. The CSC editors were offered them for free. I have a few favs from them and at the top is that pink babydoll dress on the right hand cover of the Spring/Summer 2018 issue. I just have to get some tracing paper and then I should be ready to go. January sort of flew by without much fanfare. It’s normally a busy month and this January was no exception. However, on top of being busy, I was also dealing with an increasingly worse cough. Since November, it has been getting worse and worse. I’ve had it since November 2016. For anyone who has had a cold with a bad cough, you know how the aches and pains increase throughout your sickness. Now imagine that over a year and a few months. My ribs are aching every day. My throat is constantly scratchy. I’m exhausted. Luckily, I now have a new respirologist who is going to work with me to figure out how to get it under control. Since seeing him for the first time last Thursday, I have seen a bit of improvement! It was such a relief finally having a doctor on my side to fix this cough. My previous respirologist spent the year telling me I must not be taking my meds correctly and blaming me for the issues. She failed to order tests and, when I had pneumonia at the beginning of last year, missed that diagnosis entirely. When my current respirologist said to me that he’d figure out how to manage my symptoms and make it easier for me to breathe, I basically cried in his office. Imagine: breathing! What an amazing thing that would be. Other than spending a lot of time forcibly resting due to the cough, I got through my pile of mending. At the beginning of the year, I went through all my clothes and packed up a bunch for donation. There were a few items I set aside to be fixed to make them wearable again. I made these two Concord tops ages ago when the Concord T was just released. My shape has changed a bit since then, especially in my arms and the shoulders kept slipping on both tops. The other issue with the tops was the fabric. On the red one, the sleeves have become too tight and don’t have as much stretch causing the shoulders to fall down. On the blue and white one, the fabric has poor recovery and the neckline became stretched out by the end of the day. As a result, I haven’t worn either top in a while. My solution with my Turner dress last year was to put a cowl on it and I decided to go that way for these two tops as well. 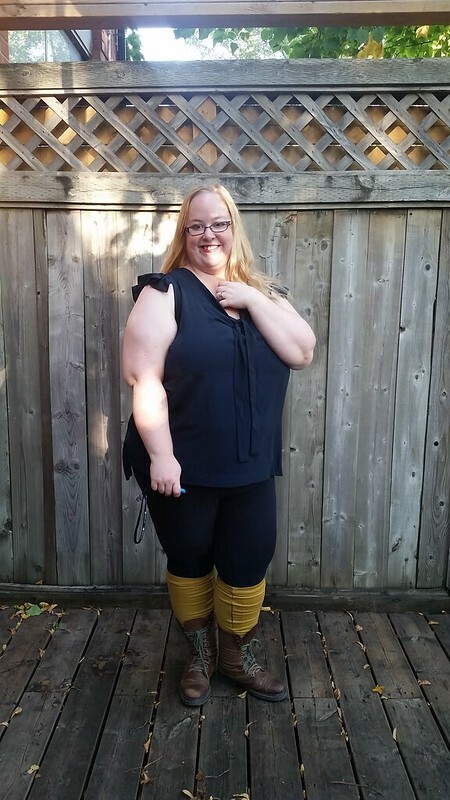 I love a cowl neck top! I happened to have the exact right of leftover material for both tops in my scraps bin. Lucky lucky! Both cowls are just tubes of fabric sewn on the neckline. 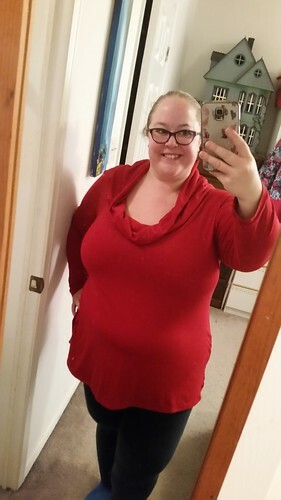 I’ve worn both tops a bunch since fixing them and am really happy I did that instead of throw them in a donation bin. These two skirts had a poor choice for fabric on the hem bands. The fabric was some sort of blend that I picked up at the thrift store. It started breaking down faster than the quilting cotton I used for the skirt. Instead of tossing the skirts out, I took the hems off and replaced them with quilting cotton. Now they are back in my wardrobe rotation and look great. 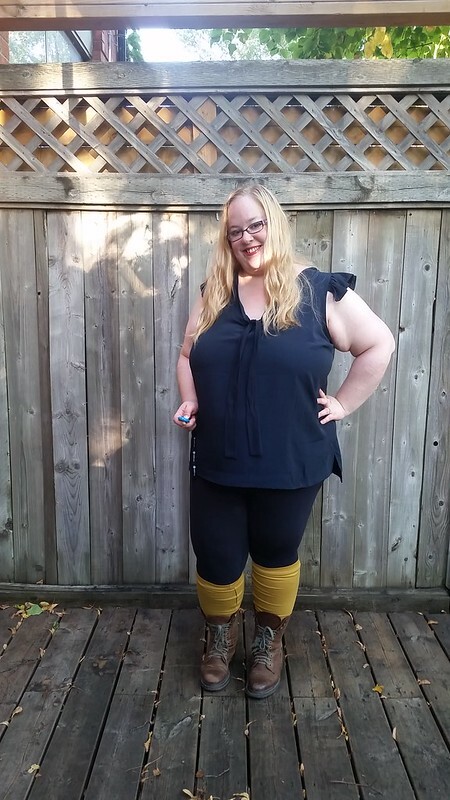 I also patched up several pairs of leggings, but I didn’t bother with a picture for those. And I replaced buttons on a cardigan. I wasn’t a fan of the buttons I originally used on it. 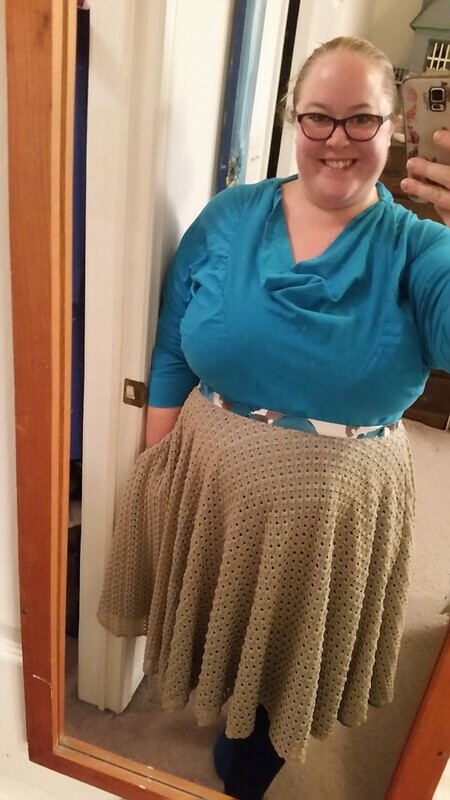 The final thing I did was take an eShakti dress and turn it into a skirt. 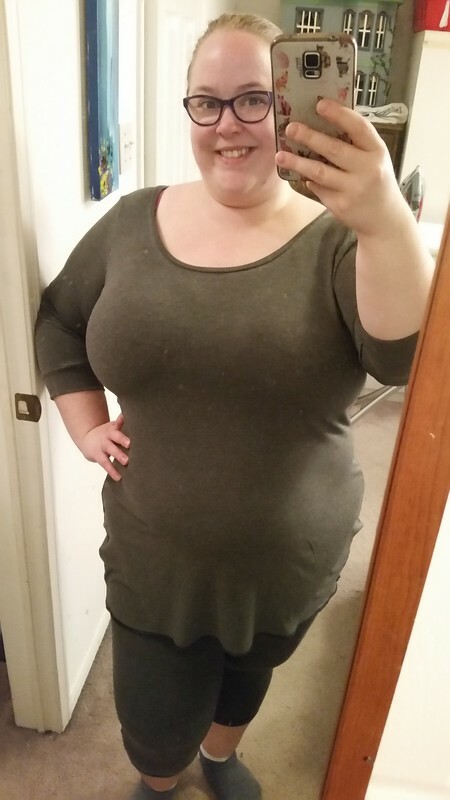 The bodice on the dress did not fit well and I always covered it up with a sweater. I figured why do that when I could just make it into a skirt. It’s difficult to see in the picture, but the skirt is underlined with turquoise lining that peaks through the lace overlay. 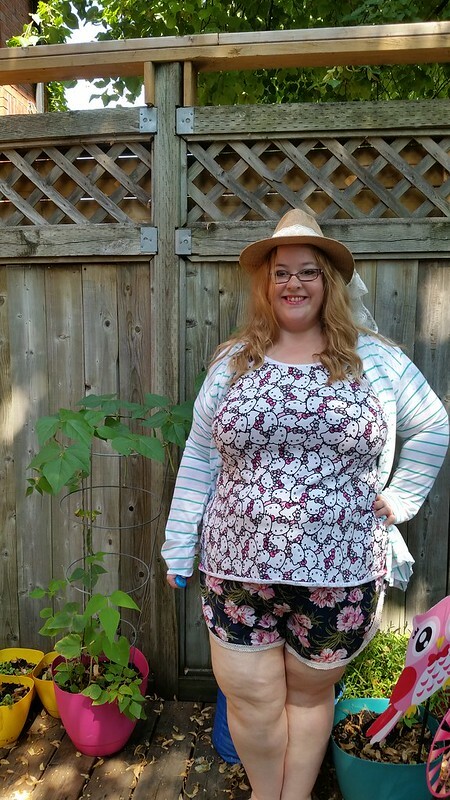 I had a turquoise, white and grey floral print in my scrap bin that matched the colours perfectly and I used that for a thin waistband. Now I can wear it with confidence. 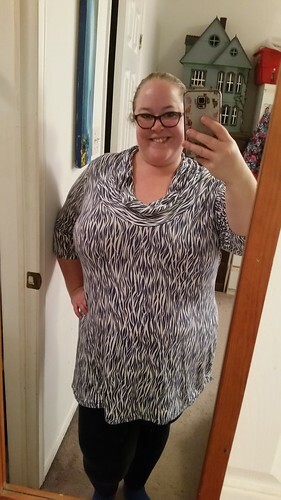 The dress originally had pockets so I kept them, of course! 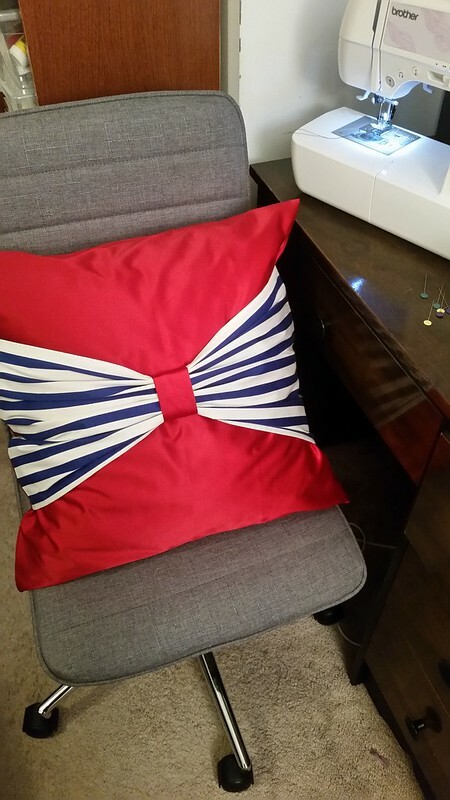 I also busted some more scraps by making a quick envelope pillow case for a throw pillow. 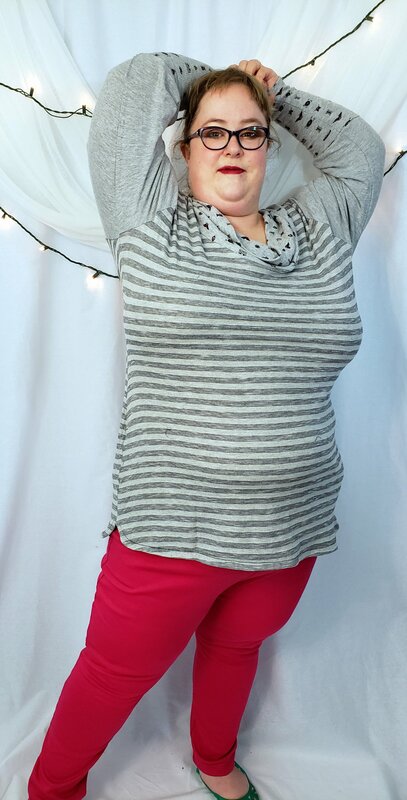 I love the bow on the front and the use of the striped fabric. It has a nautical feel to it. 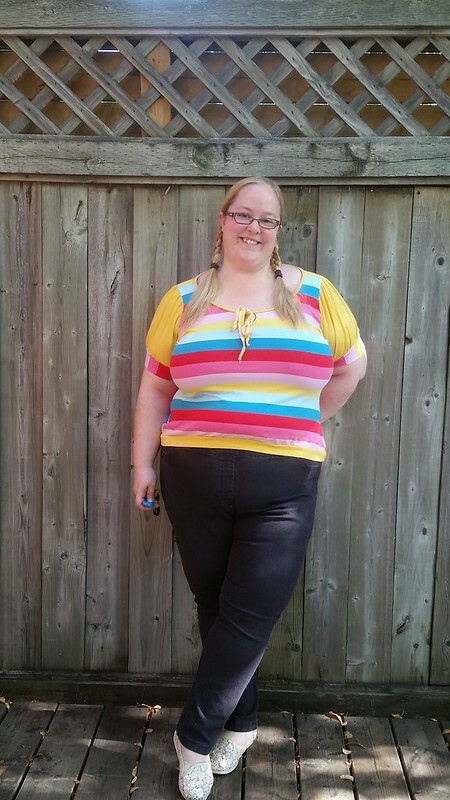 Speaking of stripes, get ready for the Sewcialists #sewstripes month for February. I have a project to share soon for that. I have only 2 UFOs to tackle (both are half done), but I am glad to get my mending pile done and out of the way. New year, fresh start. 🙂 Now my to-do list is ridiculously long so February will be pretty busy. Blank Slate Barton Shorts in a floral linen rayon blend with cotton lace trim. I’ll write a separate blog post on this later since it is my first time using the pattern. Cashmerette Concord t-shirt in Hello Kitty print cotton lycra. I made my usual a 22G/H graded to a 24 at the waist. It’s seriously my favourite shirt to date. I want to wear it all the time. Swoon Scarf Neck Cardigan in a lightweight rib knit with white and green stripes. More on this in a different blog post later. Blank Slate Oceanside shorts in green rayon linen blend. I made a 3XL again. I compared the pieces to the final pattern version since I made the tester version before and decided to go with the tester version again. It looks like I would need to do a few adjustments to the final version of the pattern for fit so I decided to continue using the tester. 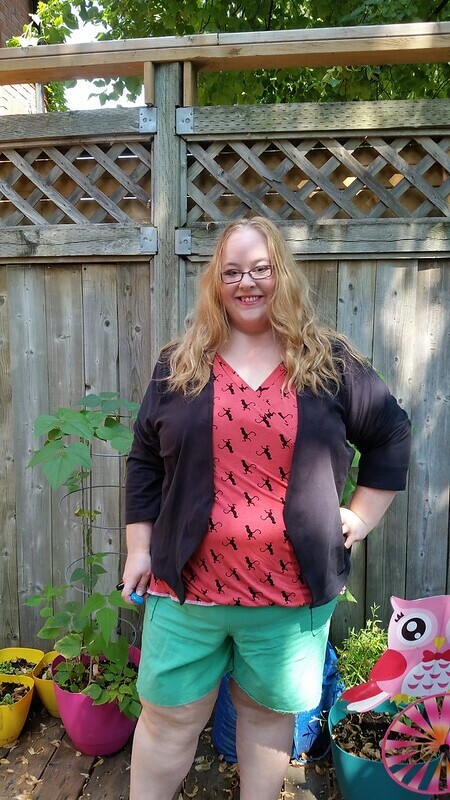 Cashmerette Dartmouth top in pink monkey bamboo jersey. I made a 22G/H graded to 24 at the waist. I had to shorten the length by about 3 inches. It might have been because the fabric is really drapey and heavy. I love it. It fits perfectly. Decades of Style Three’s a Charm Jacket in black jersey. I’ve made the jacket before and really liked it. 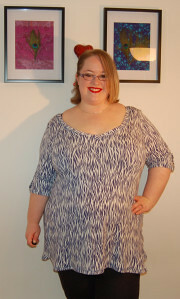 The pattern is made for wovens but I really wanted to try it in a knit. I love the style. It ends up as a boxy jersey jacket. 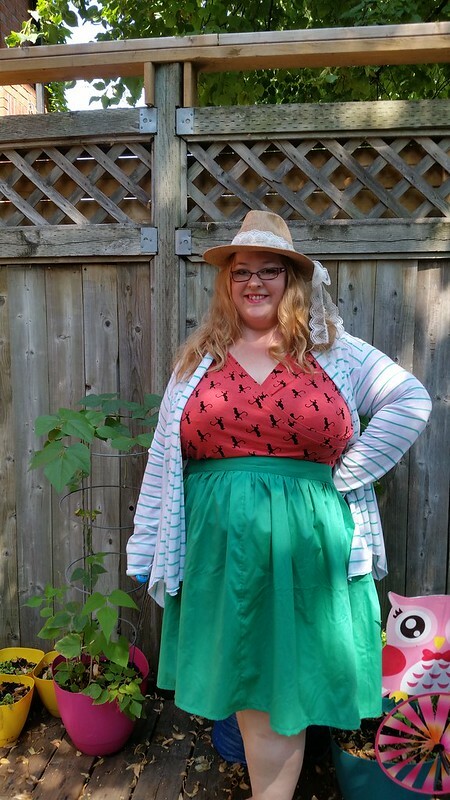 Cashmerette Upton skirt hack. I made a 24. I had to shorten the length to fit it on my fabric. It’s made with green cotton fabric. 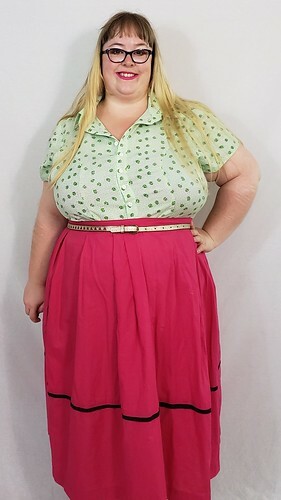 I gathered the skirt instead of pleated and extended the waistband by 2 inches to get an overlapping back for my closure. I think next time I will shorten the front waistband by an inch and half since it ended up a bit too long. 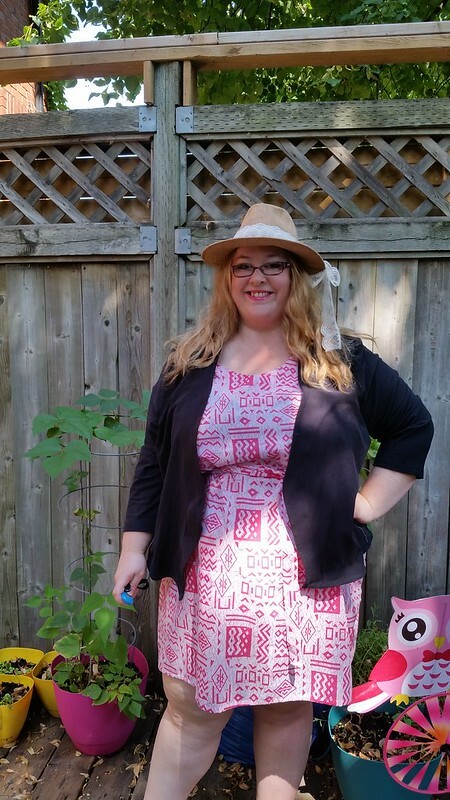 Cashmerette Webster dress in a soft pink and white patterned cotton. More on this in a later post. 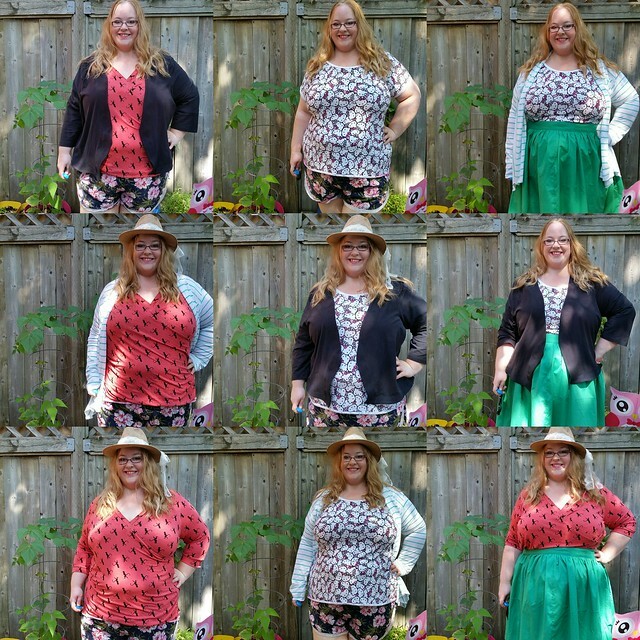 I love how I accidentally made a nicely matching capsule wardrobe. I bought most of the fabric at the thrift store and it just happened to go together really well. 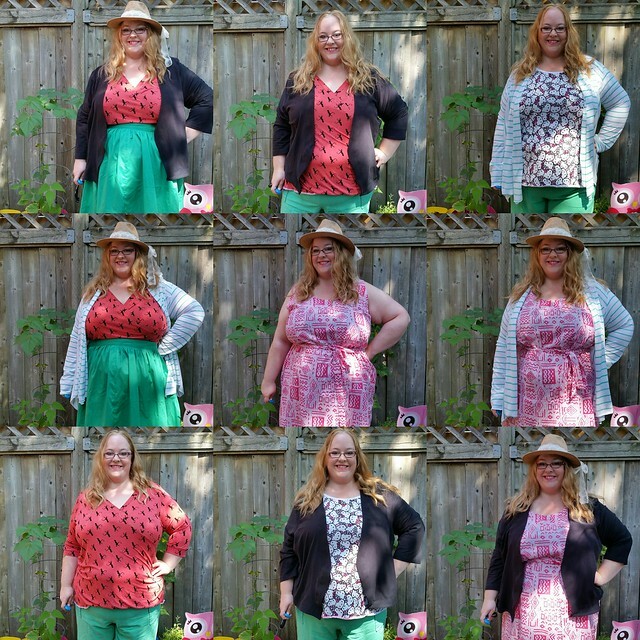 I got the Pink Monkey print locally, the linen rayon fabrics were from fabricville and the cotton lycra Kello Kitty print was from a Christmas gift exchange at a Sewcialist meet up here in Toronto. 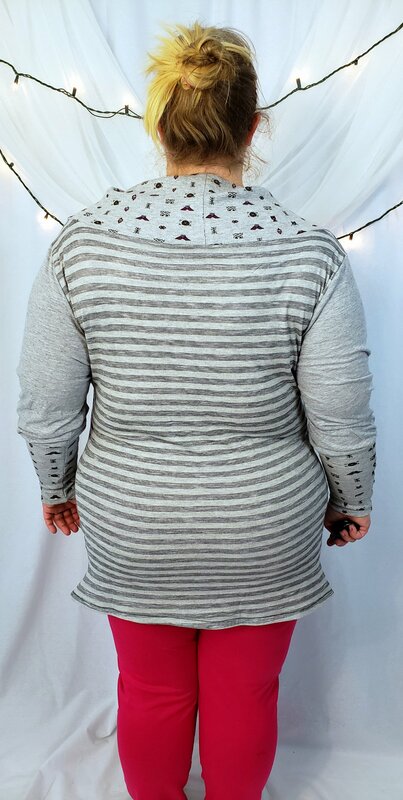 I’ll be sharing more information on each garment in the next couple of weeks and probably another Swoon cardigan since I just got some super cheap sheer white fabric from Fabricland for another version. Stay tuned! Luckily, I was not absent from blogging due to illness, but due to summer being busy and fun so far! My main source of enjoyment has been my garden. I haven’t taken a recent picture of my garden. The tomato plants have grown to be 3 feet tall! The cucumber, red peppers, and beans are coming along too. Sadly, the amount of rain drowned my herb seedlings and made my lettuce turn from good to bad in a day. Oh well, lessons learned. I will buy some mature herb plants soon and just keep them inside, I think. The big news is that I met Kat! She came all the way from New Zealand and we met up and did some fabric shopping. She brought me some tasty chocolate and lush merino from New Zealand. We also bought matching pink monkey jersey! It was so good meeting her. We even discussed a Monthly Stitch meetup in Japan for 2018. I’d love to do that! 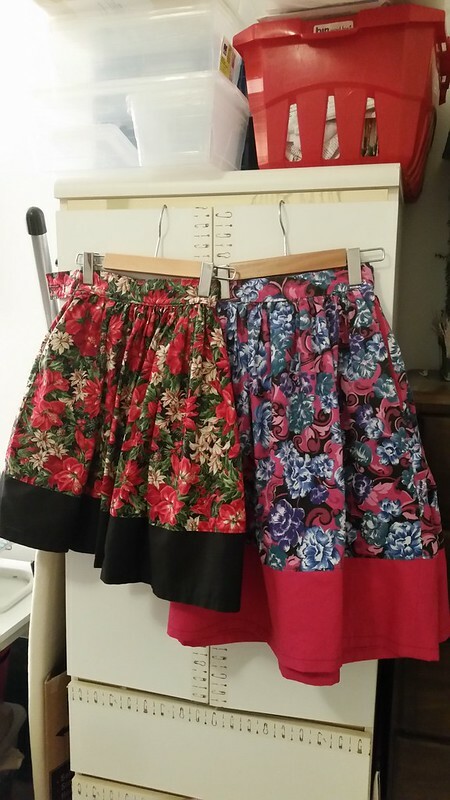 In the sewing world, I made three more Pavlova skirts. 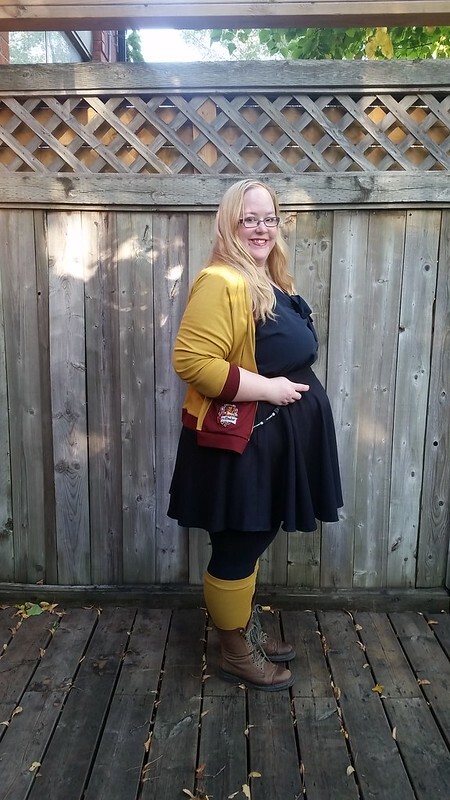 Cake Patterns is no longer, but this skirt pattern is a staple for me. Unfortunately, I need to alter the black skirt since I mis-measured and need about another inch and a half. Luckily the skirt has pleats and a long waistband to let out. 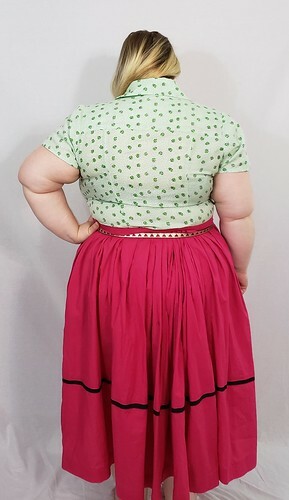 The skirts have pleats in the front and in the back. They are meant to copy this Butterick skirt pattern by Gertie. In my version the pleats are a bit different and a bit more flattering on me. I seriously love the black and white skirt and wear it a ton in spite of it being made in a mid-weight suiting material. The blue one is pretty short and works great for a variety of casual cosplay, including Wonder Woman. I made a new born outfit for a friend’s baby boy. I have two dress cut out and ready to make for two different friends. I have to get on those and send them off. I’m not doing great on stashbusting…. I still have UFOs and am slowly getting through them. These Misty Jeans require topstitching. I still need to redo this dress. I think I will take the waistband off and add darts to the skirt. At first, I was just going to do fisheye darts, but now I want to do it properly. My swimsuit is half done. The bottoms are all done. They look messy when laid flat, but are fine on me. I have to make the bra top soon. Done now, but I didn’t take another picture after this. I cut out and made a Concord T shirt yesterday. I also have an Appleton maxi almost done. Here is a sneak preview.